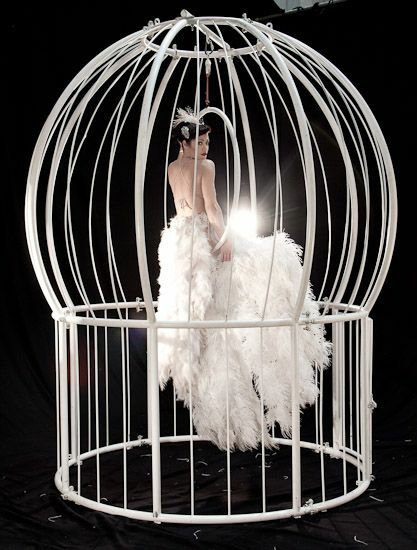 The Giant Birdcage is one of the biggest, most daring props in Neo-Burlesque measuring 10ft high by 8ft wide and fitted with an aerial hoop and pyrotechnics. It has been installed in some of the UK’s most elite art galleries, hotels and ballrooms since 2006. Drawing on her diversity of styles and skills the aerialists work with the birdcage to present a truly unique show that will be a talking point at any event. 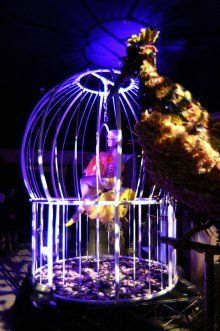 The Aerialists perform their original birdcage show, lavishly costumed in sequins and enveloped in feathers as she swings above you inside her beautiful birdcage. A deep grey satin cover slips off the cage to open the show. The Aerialists dazzle the senses with explosive magic, a seductive fan dance en Pointe, contact fire and aerial hoop skilfully worked into a fast moving cabaret routine full of mystery and vaudevillian theatre; turning from top hat and tailed magician to glamorous showgirl with a confetti finale. The Baby Birdcage is a gilted bijou version of her famous Birdcage, perfect for smaller venues. The Baby Birdcage show is a quirky vaudeville show with inspiration from old time circus, German cabaret and clockwork toys. Slick and surprising, this show is guaranteed to meet to the wow factor. Opening the show in a top hat and tails, The Aerialists perform a flawless routine of fire-magic and cane dancing en pointe. A striptease reveals the Aerialists in stunning vintage corset and lingerie in which they perform with their large white fans. Spinning in the baby birdcage the Aerialists peel off their stockings and sets the show alight with contact fire that magically transforms into a cane. Please note that there is only a small amount of fire – body contact in the show. There is no fire breathing or fire eating is involved in the show. The length of the performance is approximately 8 minutes. The baby birdcage is approximately 6.5 foot high and 4 foot at its widest point. The crew would need around 20 minutes to build the cage. The baby cage is built onto small wheels so can be easily moved around if needed once it has been assembled.